This article is about the device used to carry out executions by beheading. For the paper slicing tool, see Paper cutter. For other uses, see Guillotine (disambiguation). A guillotine (/ˈɡɪlətiːn/; French: [ɡijɔtin]) is an apparatus designed for efficiently carrying out executions by beheading. The device consists of a tall, upright frame in which a weighted and angled blade is raised to the top and suspended. The condemned person is secured with stocks at the bottom of the frame, positioning the neck directly below the blade. The blade is then released, to quickly fall and forcefully decapitate the victim with a single, clean pass so that the head falls into a basket below. The device is best known for its use in France, in particular during the French Revolution, where it was celebrated as the people's avenger by supporters of the revolution and vilified as the pre-eminent symbol of the Reign of Terror by opponents. The name dates from this period, but similar devices had been used elsewhere in Europe over several centuries. The display of severed heads had long been one of the most common ways a European sovereign displayed their power to their subjects. The guillotine remained France's standard method of judicial execution until the abolition of capital punishment in 1981. The last person to be executed in France was Hamida Djandoubi, who was guillotined on 10 September 1977. This was also the last time that the government of a Western nation ever executed an individual by beheading. Within these three openings are the hallows set for them. And behold what I would do to them if their three heads were therein ... She setteth her hand toward the openings and draweth forth a pin that was fastened into the wall, and a cutting blade of steel droppeth down, of steel sharper than any razor, and closeth up the three openings. "Even thus will I cut off their heads when they shall set them into those three openings thinking to adore the hallows that are beyond." The Halifax Gibbet was a wooden structure consisting of two wooden uprights, capped by a horizontal beam, of a total height of 4.5 metres (15 ft). The blade was an axe head weighing 3.5 kg (7.7 lb), attached to the bottom of a massive wooden block that slid up and down in grooves in the uprights. This device was mounted on a large square platform 1.25 metres (4 ft) high. It is not known when the Halifax Gibbet was first used; the first recorded execution in Halifax dates from 1280, but that execution may have been by sword, axe, or gibbet. The machine remained in use until Oliver Cromwell forbade capital punishment for petty theft. It was used for the last time, for the execution of two criminals on a single day, on 30 April 1650. Holinshed's Chronicles of 1577 included a picture of "The execution of Murcod Ballagh near Merton in Ireland in 1307" showing a similar execution machine, suggesting its early use in Ireland. The Maiden was constructed in 1564 for the Provost and Magistrates of Edinburgh, and it was in use from April 1565 to 1710. One of those executed was James Douglas, 4th Earl of Morton, in 1581, and a 1644 publication began circulating the legend that Morton himself had commissioned the Maiden after he had seen the Halifax Gibbet. The Maiden was readily dismantled for storage and transport, and it is now on display in the National Museum of Scotland. Joseph-Ignace Guillotin, together with German engineer Tobias Schmidt, built a prototype for the guillotine. Schmidt recommended using an angled blade as opposed to a round one. On 10 October 1789, physician Joseph-Ignace Guillotin proposed to the National Assembly that capital punishment should always take the form of decapitation "by means of a simple mechanism." Sensing the growing discontent, Louis XVI banned the use of the breaking wheel. In 1791, as the French Revolution progressed, the National Assembly researched a new method to be used on all condemned people regardless of class, consistent with the idea that the purpose of capital punishment was simply to end life rather than to inflict pain. A committee was formed under Antoine Louis, physician to the King and Secretary to the Academy of Surgery. Guillotin was also on the committee. The group was influenced by the Italian Mannaia (or Mannaja: which had been used ever since Roman times), the Scottish Maiden and the Halifax Gibbet, which was fitted with an axe head weighing 7 pounds 12 ounces (3.5 kg). While these prior instruments usually crushed the neck or used blunt force to take off a head, devices also usually used a crescent blade and a lunette (a hinged two part yoke to immobilize the victim's neck). Laquiante, an officer of the Strasbourg criminal court, designed a beheading machine and employed Tobias Schmidt, a German engineer and harpsichord maker, to construct a prototype. Antoine Louis is also credited with the design of the prototype. The memoirs of the official executioner claim that King Louis XVI (an amateur locksmith) recommended that an oblique blade be used instead of a crescent blade, lest the blade not fit all necks (ironically, the king's own was offered up discreetly as an example). The first execution by guillotine was performed on highwayman Nicolas Jacques Pelletier on 25 April 1792. He was executed in front of what is now the city hall of Paris (Place de l'hôtel de ville). All citizens deemed guilty of a crime punishable by death were from then on executed there, until the scaffold was moved on 21 August to the Place du Carrousel. The machine was successful because it was considered a humane form of execution, contrasting with the methods used in the pre-revolutionary Ancien Régime. In France, before the invention of the guillotine, members of the nobility were beheaded with a sword or an axe, which often took two or more blows to kill the condemned. (The condemned or their families would sometimes pay the executioner to ensure that the blade was sharp, to achieve a quick and relatively painless death.) Commoners were usually hanged, which could take many minutes. In the early phase of the French Revolution, the slogan À la lanterne (in English: To the Lamp Post!, String Them Up! or Hang Them!) had become a symbol of popular justice in revolutionary France. The revolutionary radicals hanged officials and aristocrats from street lanterns. Other more gruesome methods of execution were also used, such as the wheel or burning at the stake. The guillotine was thus perceived to deliver an immediate death without risk of suffocation. Furthermore, having only one method of civil execution was seen as an expression of equality among citizens. The guillotine was then the only civil legal execution method in France until the abolition of the death penalty in 1981, apart from certain crimes against the security of the state, or for the death sentences passed by military courts, which entailed execution by firing squad. For a period of time after its invention, the guillotine was called a louisette. However, it was later named after Guillotin who had proposed that a less painful method of execution should be found in place of the breaking wheel, though he opposed the death penalty and bemoaned the association of the guillotine with his name. Louis Collenot d'Angremont was a royalist famed for having been the first guillotined for his political ideas, on 21 August 1792. During the Reign of Terror (June 1793 to July 1794) about 17,000 people were guillotined. Former King Louis XVI and Queen Marie Antoinette were executed at the guillotine in 1793. Towards the end of the Terror in 1794, revolutionary leaders such as Georges Danton, Saint-Just and Maximilian Robespierre were sent to the guillotine. Most of the time, executions in Paris were carried out in the Place de la Revolution (former Place Louis XV and current Place de la Concorde); the guillotine stood in the corner near the Hôtel Crillon where the statue of Brest can be found today. The machine was moved several times, to the Place de la Nation, the Place de la Bastille but returned especially for the execution of the king and for Robespierre. For a time, executions by guillotine were a popular form of entertainment that attracted great crowds of spectators, with vendors selling programs listing the names of the condemned. But more than popular entertainment alone, during the Reign of Terror, the guillotine symbolized revolutionary ideals: equality in death equivalent to equality before the law, open and demonstrable revolutionary justice, and the destruction of privilege under the Ancien Régime which included separate forms of execution for the nobility. As such, the guillotine was considered a positive force for progress by the Parisian sans-culottes, the popular public face of lower-class patriotic radicalism in the French Revolution. After the French Revolution, executions began again in the city center. On 4 February 1832, the guillotine was moved behind the church of Saint Jacques, just before being moved again, to the Grande Roquette prison, on 29 November 1851. On 6 August 1909, the guillotine was used on the junction of the Boulevard Arago and the Rue de la Santé, behind the La Santé Prison. The last public guillotining in France was of Eugen Weidmann, who was convicted of six murders. He was beheaded on 17 June 1939 outside the prison Saint-Pierre, rue Georges Clemenceau 5 at Versailles, which is now the Palais de Justice. A number of problems with that execution (inappropriate behavior by spectators, incorrect assembly of the apparatus, and the fact that it was secretly filmed) caused the French government to order that future executions be conducted in private in the prison courtyard. The guillotine remained the official method of execution in France until the death penalty was abolished in 1981. The final three guillotinings in France before its abolition were those of child-murderers Christian Ranucci (on 28 July 1976) in Marseille, Jérôme Carrein (on 23 June 1977) in Douai and torturer-murderer Hamida Djandoubi (on 10 September 1977) in Marseille. In the late 1840s the Tussaud brothers Joseph and Francis, gathering relics for Madame Tussauds wax museum, visited the aged Henry-Clément Sanson, grandson of the executioner Charles Henri Sanson, from whom they obtained parts, the knife and lunette, of one of the original guillotines used during the Reign of Terror. The executioner had "pawned his guillotine, and got into woeful trouble for alleged trafficking in municipal property". In Germany, where the guillotine is known as the Fallbeil ("falling axe"), it was used in various German states from the 19th century onwards, becoming the preferred method of execution in Napoleonic times in many parts of Germany. The guillotine and the firing squad were the legal methods of execution during the era of the German Empire (1871–1918) and the Weimar Republic (1919–1933). 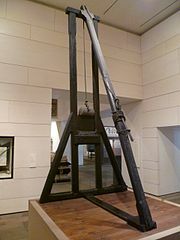 The original German guillotines resembled the French Berger 1872 model, but they eventually evolved into more specialized machines largely built of metal with a much heavier blade enabling shorter uprights to be used. Accompanied by a more efficient blade recovery system and the eventual removal of the tilting board (or bascule) this allowed a quicker turn-around time between executions, those deemed likely to struggle were backed up from behind a curtain in order to shield their view of the device. Additionally, the blade was covered by a metal screen in order to hide it from sight. The guillotine was used in Nazi Germany between 1933 and 1945 to execute 16,500 prisoners, including 10,000 executions between 1944–1945 alone. One of these Nazi executions was that of Sophie Scholl, who was convicted of high treason after distributing anti-Nazi pamphlets at the University of Munich with her brother Hans, and other members of the German student resistance group, the White Rose. The guillotine was used for the last time in West Germany in 1949 (in the execution of Richard Schuh) and it was last used in East Germany in 1966 (in the execution of Horst Fischer). The guillotine was used in East Germany by the Stasi between 1950 and 1966 for secret executions. A number of countries, primarily in Europe, continued to employ this method of execution into the 19th and 20th centuries. In Antwerp (Belgium), the last person to be beheaded was Francis Kol. Convicted of robbery and murder, he received his punishment on 8 May 1856. During the period from 19 March 1798, until 30 March 1856, there were 19 beheadings in Antwerp. In Switzerland it was used for the last time by the canton of Obwalden in the execution of murderer Hans Vollenweider in 1940. The guillotine was also introduced into Greece in 1834, along with the firing squad, as a method of execution. It was last used in Greece in 1913. In Sweden, where beheading became the mandatory method of execution in 1866, the guillotine replaced manual beheading in 1903 and it was used only once, in the execution of murderer Alfred Ander in 1910 at Långholmen Prison, Stockholm. He was also the last person to be executed in Sweden before capital punishment was abolished in that country in 1921. Swedish child killer Hilda Nilsson was scheduled to be executed by guillotine in 1917. She evaded that fate when her death sentence was commuted to life in prison. She hanged herself in prison before the commutation was communicated to her. In South Vietnam, after the Diệm regime enacted the 10/59 Decree in 1959, mobile special military courts were dispatched to the countryside in order to intimidate the rural population and they used guillotines which had belonged to the former French colonial power in order to carry out death sentences on the spot. One such guillotine is still on show at the War Remnants Museum in Ho Chi Minh City. The only recorded use of the guillotine in North America took place on the French island of St. Pierre in 1889, of Basque-born assassin Carlos Zuzuarregui, with a guillotine brought in from Guadeloupe. In the Caribbean, it was used more routinely in Guadeloupe and Martinique, the last time in Fort-de-France in 1965. In 1996 in the US, Georgia State Representative Doug Teper unsuccessfully sponsored a bill to replace that state's electric chair with the guillotine. In recent years, a number of individuals have died by suicide using a guillotine which they had constructed themselves. 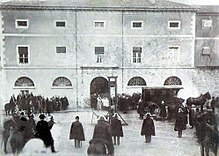 Retouched photo of the execution of Languille in 1905. Foreground figures were painted in over a real photo. From its first use, there has been debate as to whether the guillotine always provided a swift death as Guillotin had hoped. With previous methods of execution intended to be painful, there was little concern about the level of suffering that they inflicted. Because the guillotine was invented specifically to be humane, the issue of pain and suffering was seriously considered. The question of consciousness following decapitation remained a topic of discussion during the guillotine's use. It was at that point that I called out again and, once more, without any spasm, slowly, the eyelids lifted and undeniably living eyes fixed themselves on mine with perhaps even more penetration than the first time. Then there was a further closing of the eyelids, but now less complete. I attempted the effect of a third call; there was no further movement – and the eyes took on the glazed look which they have in the dead. ^ a b (in French) Loi n°81-908 du 9 octobre 1981 portant abolition de la peine de mort Archived 31 July 2013 at the Wayback Machine. Legifrance.gouv.fr. Retrieved on 2013-04-25. ^ History of the guillotine Archived 6 September 2015 at the Wayback Machine, The Guillotine Headquarters 2014. 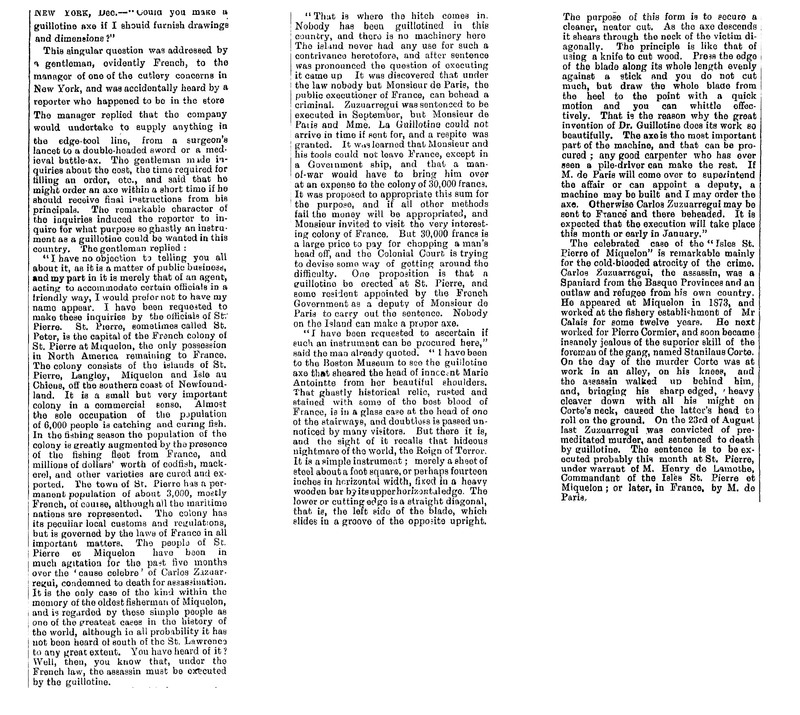 ^ Maxwell, H Edinburgh, A Historical Study, Williams and Norgate (1916), pp. 137, 299–303. ^ Bellis, Mary. "The History of the Guillotine". about.com. Retrieved 13 February 2014. ^ R. F. Opie (2003) Guillotine, Gloucestershire: Sutton Publishing Ltd, p. 22, ISBN 0750930349. ^ a b c d Executive Producer Don Cambou (2001). Modern Marvels: Death Devices. A&E Television Networks. ^ Parker, John William (26 July 1834). "The Halifax Gibbet-Law". The Saturday Magazine (132): 32. ^ Croker, John Wilson (1857). Essays on the early period of the French Revolution. J. Murray. p. 549. Retrieved 21 October 2010. ^ "Crime Library". National Museum of Crime & Punishment. Archived from the original on 1 February 2009. Retrieved 13 June 2009. [I]n 1792, Nicholas-Jacques Pelletier became the first person to be put to death with a guillotine. ^ Chase's Calendar of Events 2007. New York: McGraw-Hill. 2007. p. 291. ISBN 0-07-146818-8. ^ Scurr, Ruth (2007). Fatal Purity. New York: H. Holt. pp. 222–223. ISBN 0-8050-8261-1. ^ Abbott, Jeffery (2007). What a Way to Go. New York: St. Martin's Griffin. p. 144. ISBN 0-312-36656-6. ^ Pre-1981 penal code, article 12: "Any person sentenced to death shall be beheaded." ^ Pre-1971 Code de Justice Militaire, article 336: "Les justiciables des juridictions des forces armées condamnés à la peine capitale sont fusillés dans un lieu désigné par l'autorité militaire." ^ Pre-1981 penal code, article 13: "By exception to article 12, when the death penalty is handed for crimes against the safety of the State, execution shall take place by firing squad.". ^ Arasse, Daniel (1989). "The Guilloine and the Terror". London: Penguin. pp. 75–76. ^ Higonnet, Patrice (2000). "Goodness Beyond Virtue: Jacobins During the French Revolution ". Cambridge, MA: Harvard. p. 283. ^ Leonard Cottrell (1952) Madame Tussaud, Evans Brothers Limited, pp. 142–43. ^ Robert Frederick Opie (2013). Guillotine: The Timbers of Justice. History Press. p. 131. ^ Scholl, Inge (1983). The White Rose: Munich, 1942–1943. Schultz, Arthur R. (Trans.). Middletown, CT: Wesleyan University Press. p. 114. ISBN 978-0-8195-6086-5. ^ Rolf Lamprecht (5 September 2011). Ich gehe bis nach Karlsruhe: Eine Geschichte des Bundesverfassungsgerichts - Ein SPIEGEL-Buch. Deutsche Verlags-Anstalt. p. 55. ISBN 978-3-641-06094-7. ^ Jörg Osterloh; Clemens Vollnhals (18 January 2012). NS-Prozesse und deutsche Öffentlichkeit: Besatzungszeit, frühe Bundesrepublik und DDR. Vandenhoeck & Ruprecht. p. 368. ISBN 978-3-647-36921-1. ^ John O. Koehler (5 August 2008). Stasi: The Untold Story of the East German Secret Police. Basic Books. p. 18. ^ Bolmstedt, Åsa. "Änglamakerskan" [The angel maker]. Populär Historia (in Swedish). LRF Media. Archived from the original on 5 October 2017. Retrieved 1 December 2015. ^ Rystad, Johan G. (1 April 2015). "Änglamakerskan i Helsingborg dränkte åtta fosterbarn" [The angel maker in Helsingborg drowned eight foster care children]. Hemmets Journal (in Swedish). Egmont Group. Archived from the original on 8 December 2015. Retrieved 1 December 2015. ^ Nguyen Thi Dinh; Mai V. Elliott (1976). No Other Road to Take: Memoir of Mrs Nguyen Thi Dinh. Cornell University Southeast Asia Program. p. 27. ISBN 0-87727-102-X. ^ Farrara, Andrew J. (2004). Around the World in 220 Days: The Odyssey of an American Traveler Abroad. Buy Books. p. 415. ISBN 0-7414-1838-X. ^ Wren, Christopher S. A BIT OF FRANCE OFF THE COAST OF CANADA. The New York Times July 27, 1986. "Archived copy". Archived from the original on 1 December 2017. Retrieved 29 August 2017. CS1 maint: Archived copy as title (link) Accessed July 13, 2017. ^ "Georgia House of Representatives - 1995/1996 Sessions HB 1274 - Death penalty; guillotine provisions". The General Assembly of Georgia. Archived from the original on 4 October 2013. Retrieved 3 October 2013. ^ "Guillotine death was suicide". BBC News. 24 April 2003. Archived from the original on 27 September 2008. Retrieved 26 September 2008. ^ Sulivan, Anne (16 September 2007). "Man kills himself with guillotine". The News Herald. Tennessee. Retrieved 11 September 2016. ^ Staglin, Douglas. "Russian engineer commits suicide with homemade guillotine". USA Today. Retrieved 11 September 2016. ^ Buncomber, Andrew (3 December 1999). "Guillotine used for suicide". The Independent. Archived from the original on 2 January 2017. Retrieved 11 September 2016. ^ Dr. Beaurieux. "Report From 1905". The History of the Guillotine. Archived from the original on 25 January 2010. Retrieved 13 February 2009. ^ Clinical Journal. Medical Publishing Company. 1898. p. 436. ^ abbaye de monte-à-regret : définition avec Bob, dictionnaire d'argot, l'autre trésor de la langue Archived 14 March 2014 at the Wayback Machine. Languefrancaise.net. Retrieved on 2013-04-25. ^ a b c d e f g h Joseph-Ignace GUILLOTIN (1738–1814) Archived 15 December 2012 at the Wayback Machine. Medarus.org. Retrieved on 2013-04-25. ^ a b c d e f g h guillotine du XIVeme arrondissement Archived 8 September 2013 at the Wayback Machine. Ktakafka.free.fr. Retrieved on 2013-04-25. ^ Guillotine Archived 4 October 2012 at the Wayback Machine. Whonamedit. Retrieved on 2013-04-25. Croker, John Wilson (1853). History of the Guillotine . London: John Murray. Wikimedia Commons has media related to Guillotine. The Guillotine Headquarters with a gallery, history, name list, and quiz.